and Trout Lily (Erythronium americanum). This week Bloodroot is already developing fruit capsules. 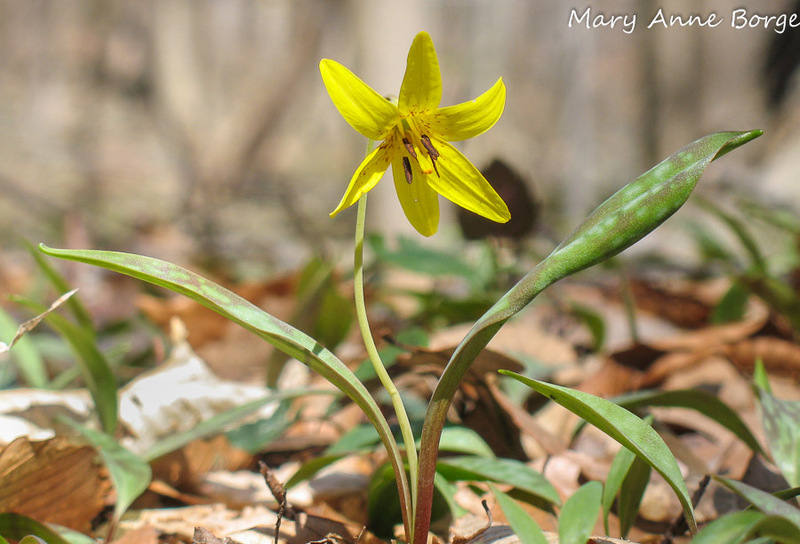 Trout Lily is still blooming on warm days, but will finish soon. 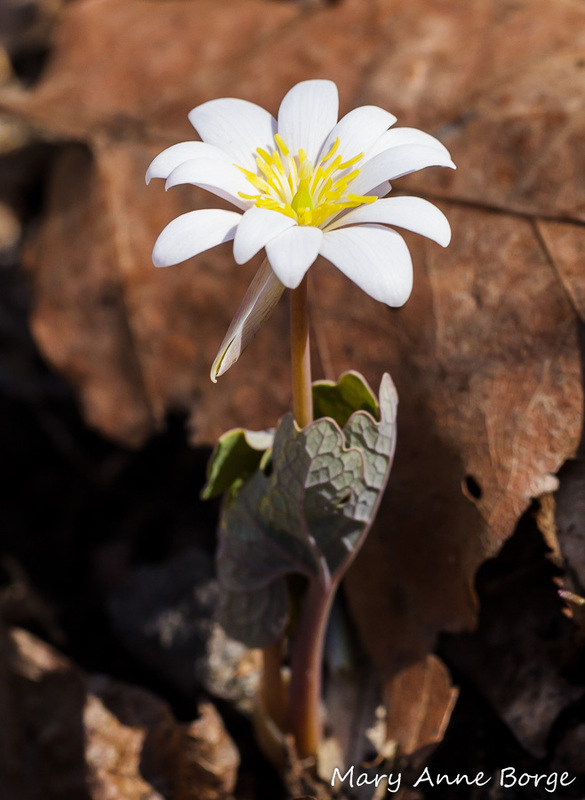 New stars have emerged from the obscurity of their winter blanket of fallen leaves to take center stage. 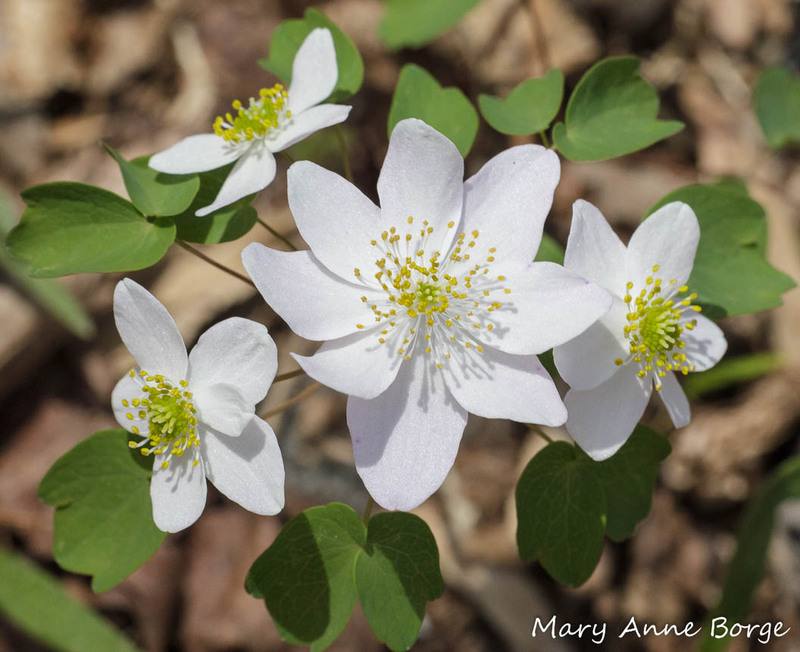 Rue Anemone (Thalictrum thalictroides), completely invisible a week ago, is now in full bloom. 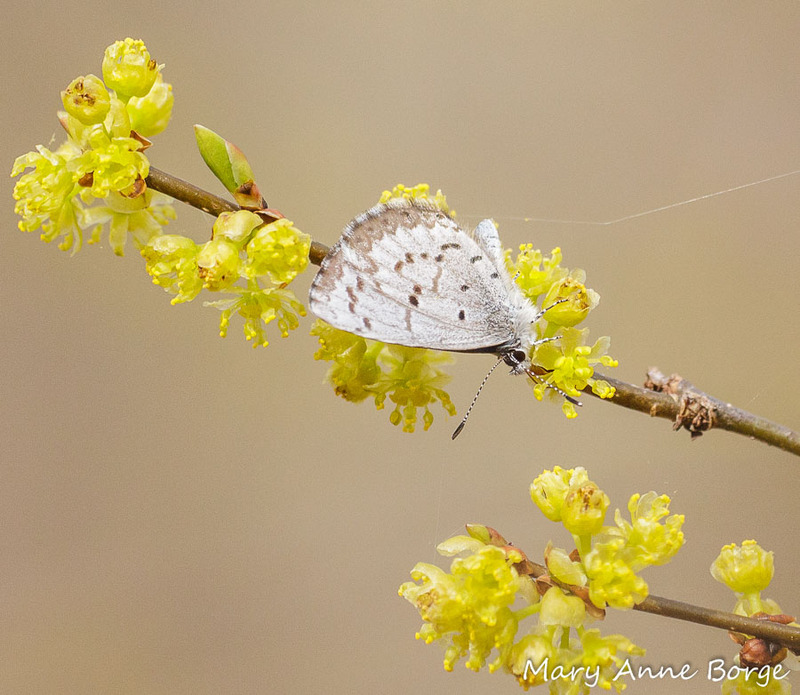 Spicebush (Lindera benzoin) is blooming, too, and the Spring Azure in the photo below is taking advantage of the nectar offered by the starburst yellow flowers. At first I couldn’t understand why she was practically laying on her side while she sipped. It seemed like an unusual posture for a nectaring butterfly, until I finally realized that she was positioning herself to catch the sun’s rays on a slightly cool and breezy spring day. Very efficient! 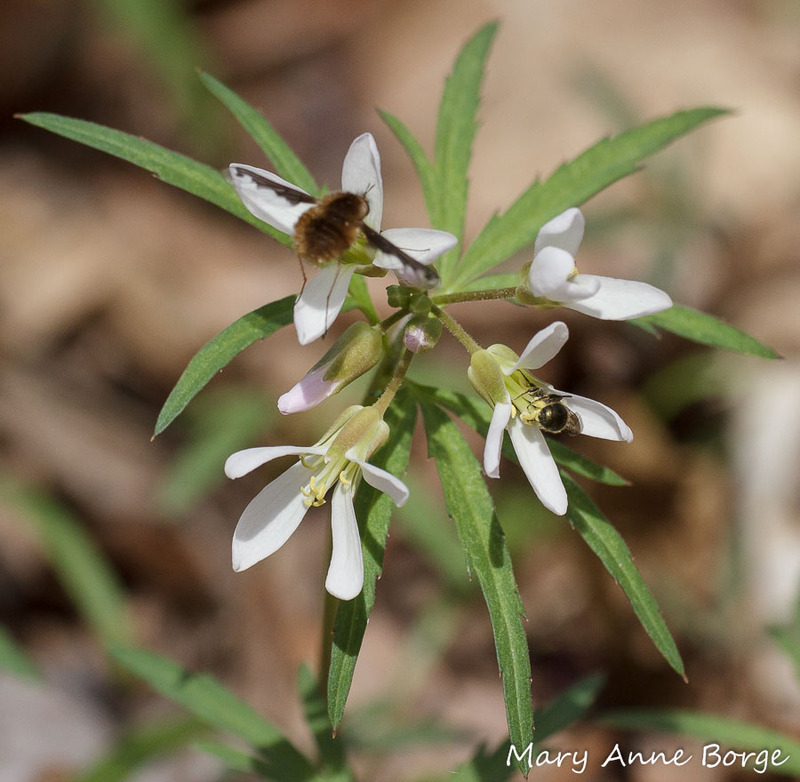 Cut-leaved Toothwort (Cardamine concatenata) blossoms are lighting up the forest floor. It gets its name from its deeply lobed leaves, and the tooth-shaped projections on its rhizomes. 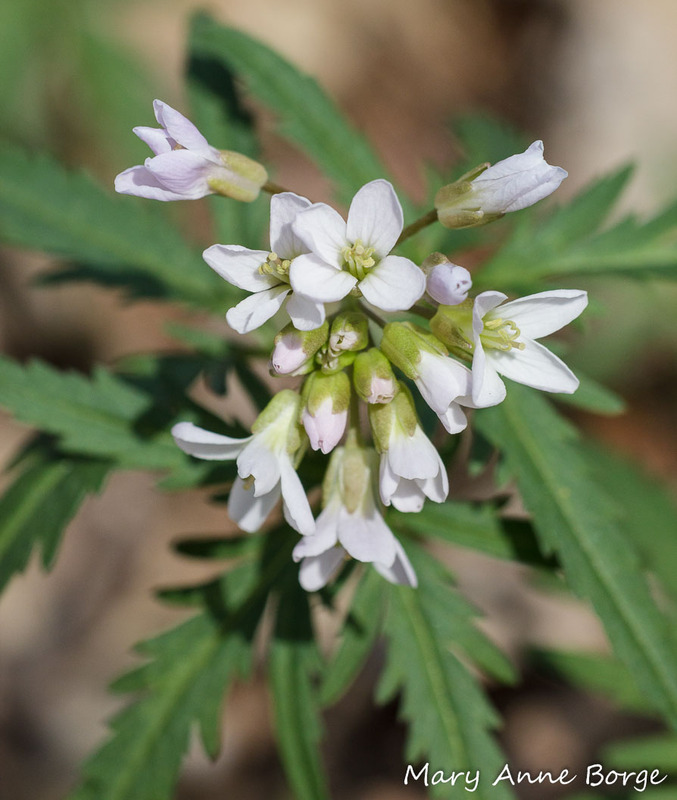 Typical of a member of the mustard family, Cut-leaved Toothwort’s flowers have four petals arranged in a cross shape, for this species forming a tube at their base. The buds have a hint of pink or violet, and while the flowers may retain a blush when open, they are most often white. Look closely at a Cut-leaved Toothwort flower, and see if you can see that it has six stamens (the male reproductive flower parts). In Cut-leaved Toothwort, the stamens are of two different heights; four stamens are long, and surround the pistil (the female flower part), while the other two are shorter and slightly apart from the others. The stamens are tipped with anthers that open to release the pollen. The pistil is a bit longer than the stamens, offering at its tip the stigma, its receptive part, for incoming pollen deposits. Plants evolve to be as efficient as possible in attracting pollinators, and in manipulating them to pick up and deposit pollen. So why would Cut-leaved Toothwort have evolved to have anthers of two different heights? If we look at some flower visitors at work we might find some clues. 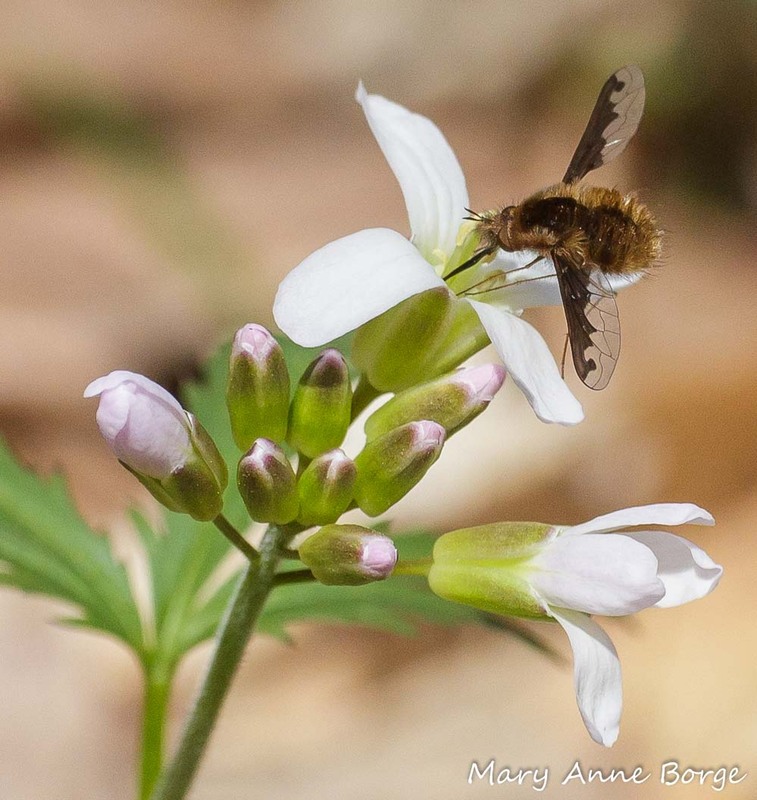 The bee-fly (Bombylius major) below is interested in nectar, which in Cut-leaved Toothwort can be found in nectaries well inside the flower. The bee-fly’s long tongue and legs enable it to eat without its body going very deep into the flower, but it may brush against at least the anthers on the taller stamens. The bee-fly’s hairy head and body are effective in picking up and transporting pollen, so it is a potential pollinator. But based on its position when visiting the flower for nectar, it may be somewhat random as to whether the bee-fly brushes the stigma to deposit the collected pollen on the next flower it visits. Bees drink nectar, and they may also eat pollen. Female bees collect both pollen and nectar to bring back to their nests as food for their larvae. 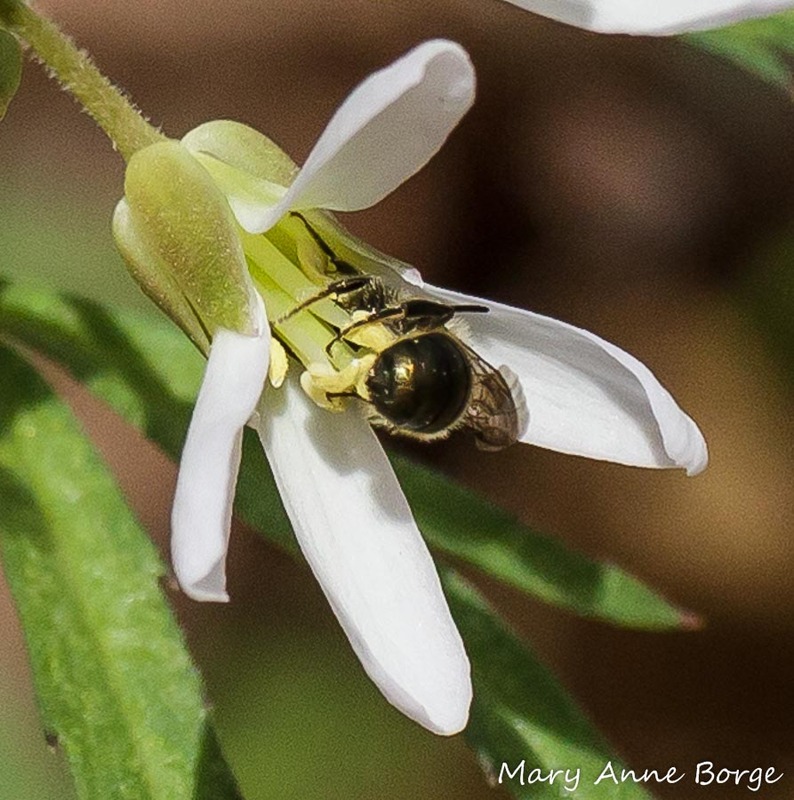 The bee in the photo below appears to be harvesting pollen from the anther of one of the shorter stamens, while at the same time its lower abdomen is brushing against the stigma, depositing any pollen it might have brought in from another Cut-leaved Toothwort flower. It will likely also pick up pollen from the taller stamens to take to the next flower it visits. So for this bee, the pollen on the short stamens offer an enticement and reward for visiting, while it is unknowingly partnering with the plant to assist in pollination when it brushes against the stigma and the pollen on the taller stamens. This could be the explanation for the two tiers of stamens. It would also seem to indicate that not all flower visitors are equally effective pollinators. 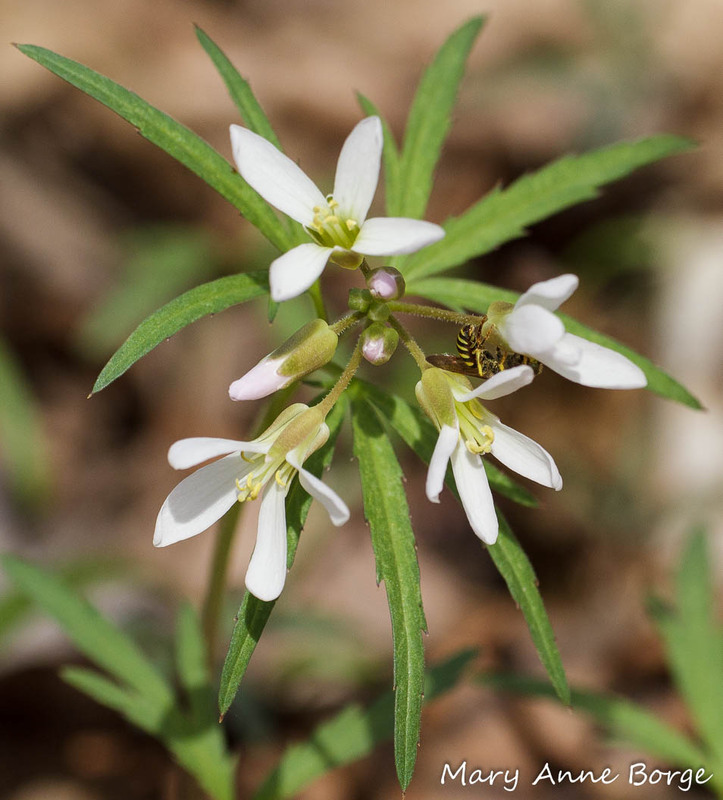 Cut-leaved Toothwort is native in deciduous woodlands in much of the eastern two thirds of North America, from North Dakota, Ontario and Quebec in the north to Texas and Florida in the south. It’s a food plant for the caterpillars of the West Virginia White and Mustard White butterflies. Populations of both of these butterfly species have declined in recent years as a result at least in part of both habitat loss and the influx of Garlic Mustard (Allaria petiolata), a species native to Europe that is invasive in North America because it lacks predators here. The caterpillars of the West Virginia White butterflies in particular are able to digest only a few species of the mustard family, those with which the butterflies evolved. Garlic Mustard’s chemical composition is similar enough to Cut-leaved Toothwort’s to lure female butterflies to lay their eggs on it, but the resulting caterpillars can’t survive on a diet of Garlic Mustard. They need Cut-leaved Toothwort. Everything changes so rapidly in spring. Don’t miss a single scene of the show! 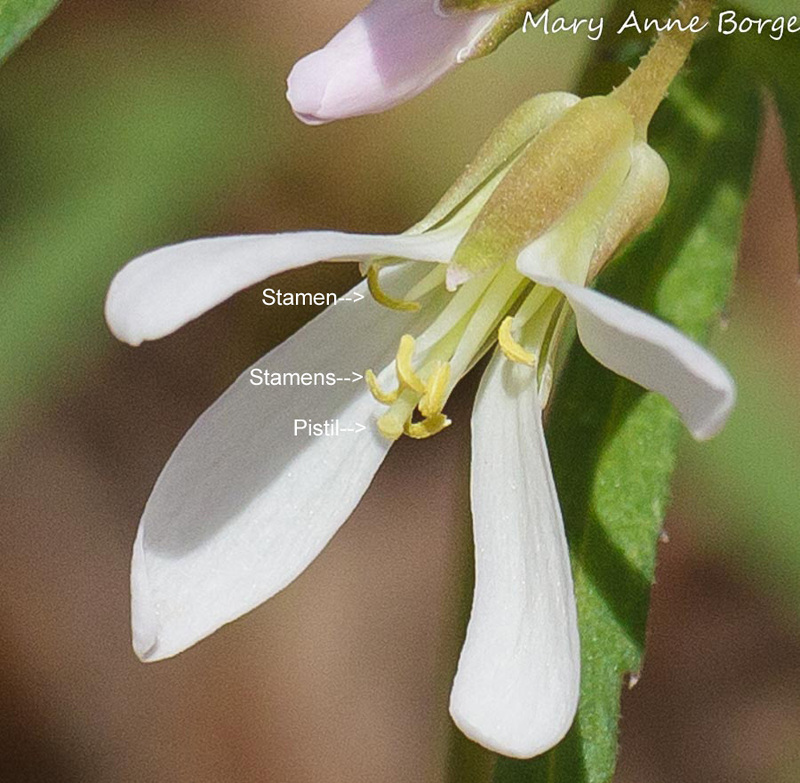 This entry was posted in Butterflies, Native Plants, Other Insects and Spiders and tagged cardamine concatenata, cut-leaved toothwort, nature, Pollinators, Spring Azure by Mary Anne Borge. Bookmark the permalink. I really enjoy reading and learning from your detailed and informative blog letters. Excellent quality in your photos too. Thanks, Mike! I’m glad you enjoy my blog. I learn something new from every post, so it’s fun for me, too. This is great! I love your blog entries!! And photos! !